Wusthof Grand Prix II 6 inch sandwich knife is just the right size for easily and smoothly cutting sandwiches. This useful knife also works for slicing luncheon meats and other sandwich ingredients. Count on Wusthof German-made knives for great quality, backed by a lifetime warranty. 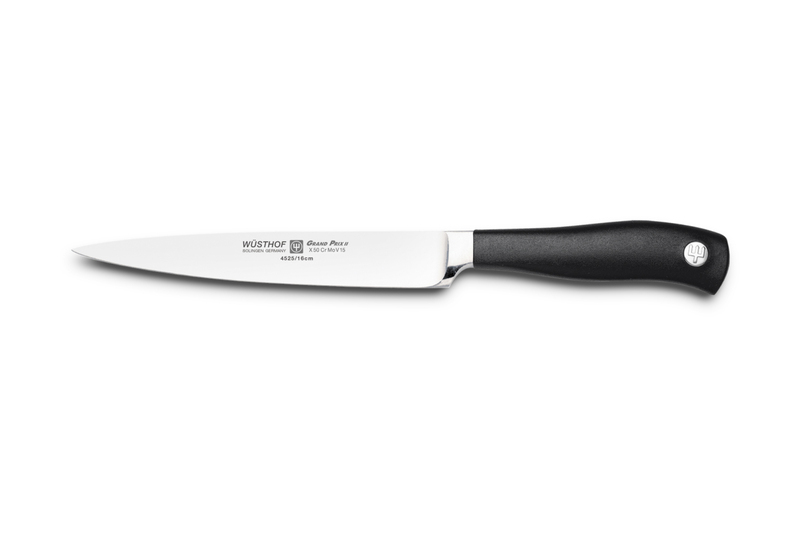 The simple design of Wusthof Grand Prix II knives has a slightly curved handle so you can more easily and firmly grip the knife for maximum control when you slice, dice, chop or peel. Forged with high carbon stainless steel to create rust resistance. Comfortable to use due to slightly rounded base of handle. It fits easily into the palm, no matter what size your hand is. Bolster, or metal that separates the blade from the handle, extends to end of blade and provides good balance for easy, non tiring cutting.